...if you are pregnant, nursing, plan to become pregnant, hope to ever have a chance at getting a girl pregnant, hate goblins, have an irrational fear of giant man-eating spiders, have lost loved ones in the Troll Wars, are illiterate, lack all sensory organs, are easily offended, despise tea, faint at the thought of bloodshed, are a raving lunatic who obsessively stalks authors to murder them in their sleep, are driving a motorized vehicle, or have not yet experienced puberty. 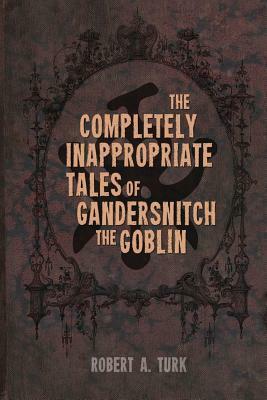 Within these pages, you will find nine short stories (and two poems) detailing the darkly depraved, mildly amusing, ultimately unscrupulous, seriously sordid, and wretchedly rotten life and adventures of Gandersnitch the Goblin, the Banished Barber of Goblonia. This book is not for the wee-set of the wee, the innocent and pure, or those with massive heart defects. These are Goblin Tales, in all their gory glory! All claims of damages arising from the misuse of these pages will be mocked most mercilessly. You have been duly warned. Continue at your own bloody risk, and enjoy the show! I'm almost hesitant to write this review. Why? Did you read that back copy? How do you follow that?!? I was given this book ages ago and somehow it got put in with a stack of other things and I didn't get to read it until recently. This is the perfect book for when you just want to escape the real world and all of its ugliness and dive into a book with a lot of ugliness but awesomeness. The stories are a lot of fun but absolutely geared to adults. I wouldn't leave this around where my younger child could pick it up..if I had a younger child. My only real negative for this book? The fact that it took me ages to find it again and to get it read. It reads as if you've pulled up a stool in the bar and the guy next to you, who's had a bit too much to drink, wants to tell you his life story. Some of the stories were better than others, but hey, that's pretty real to life, isn't it? If you're a little dark, a little demented, and love a good book...Have you met Gandersnitch?